SustainableWork: Innovation Kitchens - Celebrating our new startup! Innovation Kitchens - Celebrating our new startup! I'm helping launch the best startup of my life - Innovation Kitchens. Innovation Kitchens is being built to help develop and grow the artisan food industry. This is a time of great opportunity. Our company helps create great jobs and opens new markets for regional and specialty foods. 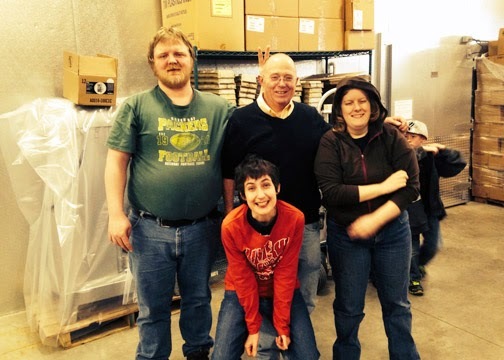 The photo is with friends at the Wisconsin Innovation Kitchen. We're not only co-workers, but I get to share in their wonderful annual party as the bingo caller. It's a highlight of my year and this was a great way to celebrate the launch of our new business! I'll report news of Innovation Kitchens here. We're not just starting a very cool new business. I also think we have a good shot at helping launch a big new market. Innovation Kitchens will be a highlight of my career. Forward. Martha's Pimento Cheese - Martha rocks!